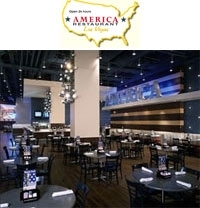 America is a Las Vegas American cafe restaurant located at New York New York Hotel & Casino. America offers around the clock breakfast lunch and dinner served in a fun environment decorated with an American theme. America features food, beer and wine from coast to coast.